Donkey Tears in San Diego – Can Progressives Build a Majority Here? San Diego has plenty of progressives. 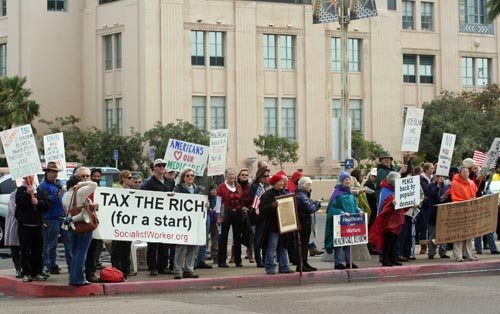 Here, progressives protest a Tea Party rally at the waterfront, February 2010. About forty activists, mostly Democrats, gathered last week for breakfast at the office of the San Diego Foundation for Change to lick their wounds, investigate what went wrong and listen to an exciting presentation on possible future progressive election victories. Lamenting the Republican gains in the mid-term elections, participants, ranging from the chair of the San Diego Democratic Club to the editor of Indian Voices to church groups, power liberals all, spoke of their despair over what many saw as a conservative turn to the electorate. Citing the right-wing control of corporate media, particularly Fox News as the official organ of the Republican Party’s extremist wing, many felt that with plentiful, secret funds they had better advertising resources and a more marketable message. Others, like Susan Weaver, of the Foundation, suggested that in tough economic times “one of the first causalities is tolerance,” alluding to exploiting cultural themes like immigration and LGBT issues; while others mentioned a pattern of “strategic obstructionism” of legislation by the GOP as well as building a vicious “Obama hatred” movement. Others echoed the betrayal of those who in 2008 overwhelmingly supported and voted for change by pointing out Democrats held their base but lost the left and independents. Young people, particularly, making up nearly 30 percent of the Democrat’s sweep in 2008 nationally turned out by less than 10 percent in the 2010 election in what was called an “enthusiasm gap” by LA Times writer Marshall Ganz. In California, the generational walk-away was even more pronounced, with 79% of young people voting for Obama’s challenges, while only 44% dragged themselves to the polls in 2010. Are Permanent Progressive Majorities in San Diego Possible? Drawing on a report “Counting on Change in San Diego: Why California’s Future Begins in San Diego’s Immigrant Communities,” which is available on the Foundation’s website, Fanestil told the political post-mortem gathering rather than lurching from one election to the next, dependent on occasional voters, it was possible to build a permanent, solid progressive bloc by focusing on the over 1 million eligible voters in San Diego County who are not registered. He mentioned the demographics of color in local elections by pointing out that while whites are only 48 percent of the county’s population, they comprise almost 70 percent of its registered voters and a whopping 83 percent of its elected representatives. By using multi-sectional, multi-racial strategies, Fanestil said that a “progressive election infrastructure” which “would sustain itself across elections” would be dependent on leadership development in the neighborhoods. He called “transactional coalitions” short lived. He vowed that the Foundation would continue to fund organizations which had a historical relationship with their communities and inspired trust and suggested that these groups would be pivotal in the consortium of California foundations’ funding for the county’s underrepresented electorate. Rocky Neptun is the Director of the San Diego Renters Union. Thanks for this. I am looking at my own lack of involvement.